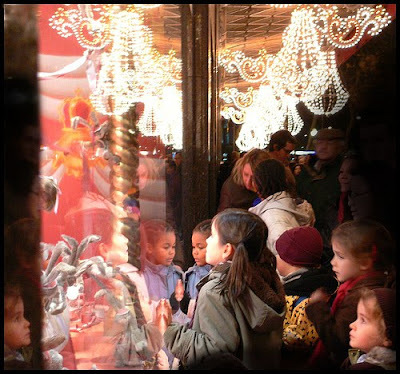 PERFECT for my children too... look at these faces taking it all in... oooh what a wonderful time of year in Paris too!!! If only Fifi was REALLY there with her family... le sigh!!! A girl can dream... someday maybe! Hope you ENJOYED my future MEMORY and my REAL MEMORY of the Past! 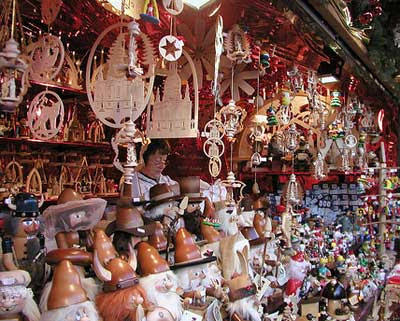 All photos of Santa's Village via HERE ... 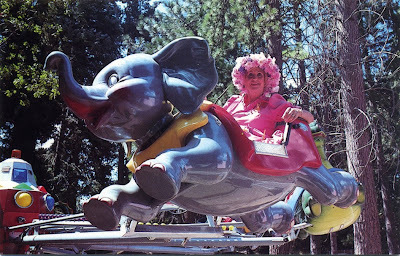 I'm sorry I do not have any photos of Fifi as a child to share at Santa's Village. 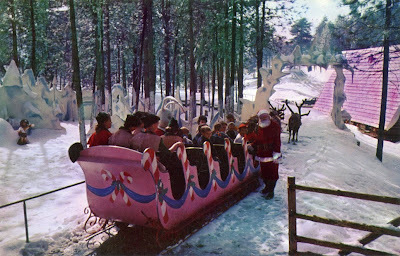 To learn more about the history of Santa's Village Skyforest visit here. Oooooh and don't let me forget to tell you the names of the Coco Chanel Book Giveaway and Fifi Flowers signed print... Sarah of Hyacinths for the Soul and Dumbwit Teller... For those of you who did not win... the book is AVAILABLE in My Etsy Shop and prints are AVAILABLE via email... if you would like a print of any of my paintings simpy contact moi! For those of you looking for holiday gifts... EVERYTHING in My Etsy Shop is 10% until the end of the year... if you don't see what you are looking for in my shop... contact me... what you are looking for may still be AVAILABLE! 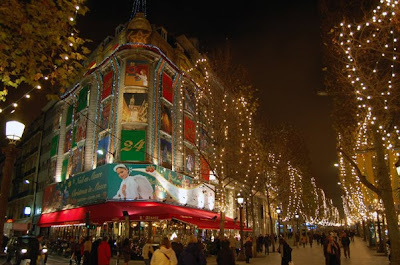 Photos in the first half of this post are via Google search for Christmas in Paris and Paris clock. Bonjour Fifi! 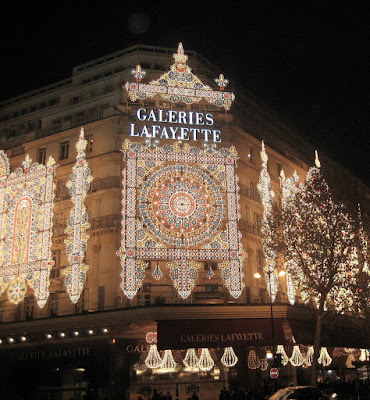 What fabulous lights - Paris is indeed so beautiful at Christmas! You should definitely paint one of these Parisien scenes and make it sparkle even more! The lights are breathtaking! I've never seen anything like it before. I have been to Santa's Village though. A couple of times as a kid, and once in my 20's. Havn't thought about that place in years. Those were much more innocent times. I remember the excitment of pulling into the parking lot. I grew up in OC and almost bought a house in Crestline in the 1980'S. Thanks for the memory. Love your pictures Fifi! Wish I was there too. I love both your future and past memories. Memories are so sweet, and a very special treasure that we always have. Every time I visit you, I wonder why I don't drop by every single day. There is such joy in your blog and in your art. 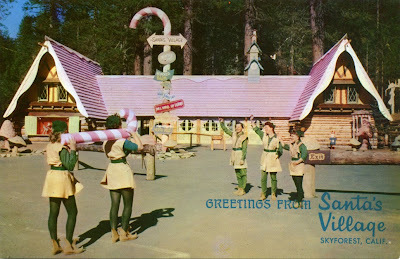 Love the images of Santas Village- looks like good kitschy fun! I loved all your pictures of Christmas in Paris! Which I could go indeed!!! It looks so romantic. I could look at these photos a million times every day from now until Christmas. 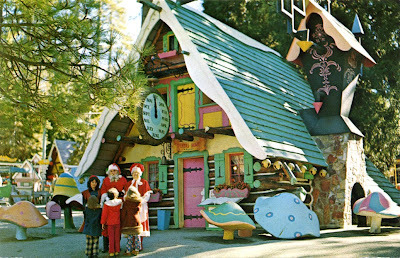 I loved Santa's Village and have such great memories of it and a pin lift over that I cherish and lots of photos. What a happy post, went straight to my heart! 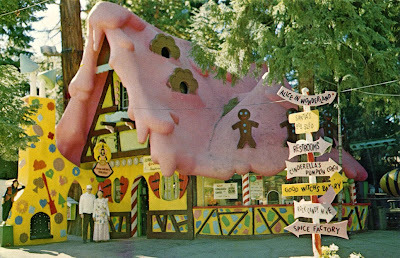 Oh Fifi, I posted pics of Santa's Village just yesterday, of course, I was there in the early years. So sad that it is gone and replaced by the glitz of mall Santas. We went every year when I was a child — to see Santa and play in the snow. I never realized until today that you live in the Los Angeles area, I always picture you in Paris, but thought you lived in some place like New York. California was my home for most of my life, left just about ten years ago. I miss it everyday. Tres belle - no wonder they call it the city of lights. Wish I was there with you. we all seem to be in love with it. i know i am, and would move there in a new york minute. 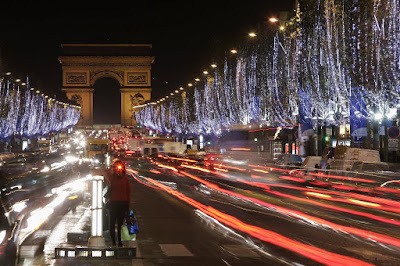 Christmas in Paris - oh Fifi could it get any better! Such awesome beauty. Got my beautiful book in the post I ordered from Esty yesterday! It is just wonderful! It was so easy to do! The art work is fab! And makes a great coffee table book! Have a great Holiday! Thank you for taking the time to follow your dreams so that others can appreciate your art! Ah Paris at Christmas! I don't think I would ever be the same after that experience! Thanks for the festivities!!!! Bonjour Fifi! I'm visiting via Pink Saturday and was so excited to see Santa's Village! My parents used to take my sisters and me to that park, too. I remember the Christmas tree in one of your photos. 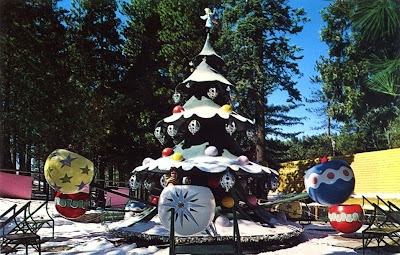 I also remember there being a snow-coated "North Pole" at the entrance. Do you remember it? I've shared some childhood memories for Pink Saturday, too. 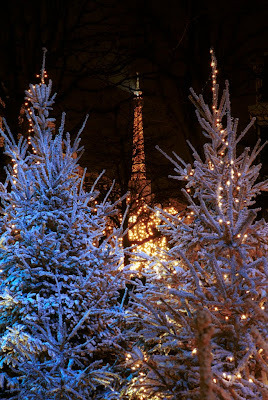 of Paris at Christmas, divine! So beautiful! Love the pics of the lights and snow on the trees. They are magical. Thanks for sharing. What wonderful pictures Fifi. Thanks for sharing them with us. Oh, thank you for traveling me to Paris this evening! I can't wait for my son to wake up in the morning and look at your Santa's Village pictures. He will gasp!! ps. I added your fine blog to my blogroll. Cheers! Ohhhh my gosh! I totally FORGOT about Santa's Village! The ads were ALWAYS on TV! Come to Santa's Village! AHHHH! I had so many memories come flooding back~~we went to Santa's Village every year!! Fifi ~ I love your Paris photos - it made me miss Paris so much. As I was looking at them I thought, I was there...wish I was there now! 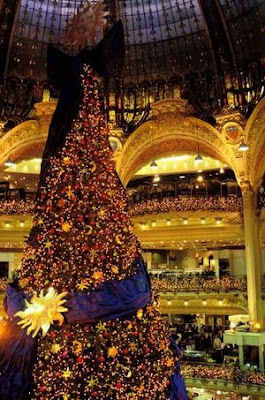 I am sure it is beautiful at Christmas. Love you memory of Santa's village. How cute is that!